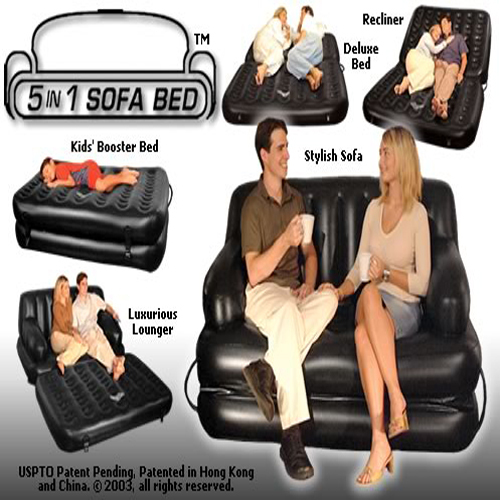 Components: 5 in 1 sofa bed,Dual action Turbo Power Pump,Air Nozzles Repair Kit,Travel Carry Bag,A fashionably-styled sofa bed to suit all manners of decor. Comes in a luxurious leather finish effect ,Strong and lightweight,Goes from Rolled-Up to Set -Up in a snap with the multi-purpose Double Action Inflation/Deflation pump, it goes from rolled up to set up in less then 120 seconds. Manufactured to the highest quality standards using state of the art materials… Built to last for years. It is built with 5-In-1S technological advances in weightless load technology and has a unique chamber support system. The 5-In-1 bed contains over 70 individual body support chambers that independently cradle, support and mould themselves to all the contours of your body. It also eliminates the “Roll-Together” effect.